The last surviving veteran to fight in the trenches during World War One has celebrated his 108th birthday. 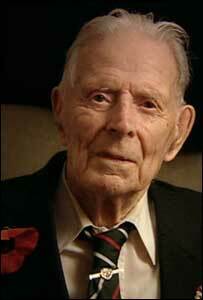 Harry Patch enjoyed a cream tea with English strawberries at a party at his nursing home in Wells, Somerset. Mr Patch served with the Duke of Cornwall's light infantry and saw action in the trenches at the bloody battle of Passchendaele. "There's no secret to enjoying a long life, my advice would be just to live a clean life," he said. Mr Patch was called up for service in 1917 when he working as an 18-year-old apprentice plumber in Bath. Shortly after his call up he was thrown into Passchendaele, also known as the Third Battle of Ypres, which claimed the lives of more than 70,000 soldiers in just three months. Heavy rain coincided with the opening assault, on 31 July, which produced thick, clinging mud, caking uniforms and clogging up rifles. Sharing his experience of the battle, Mr Patch said: "It was mud, mud and more mud mixed together with blood." "My remembrance day is on 22 September when I lost three mates," he said.